CAPE CANAVERAL, FL – (@The Comedy News) – An investigative report has revealed that the top 1% of America’s super-rich are already scheming to hog every available ticket aboard upcoming commercial spaceflights. While cable news outlets laud the historic moment in aviation and space history, corporate billionaire swine are quietly buying up all of the spots on every planned commercial spaceflight. “How amazing will it be when we have to butter up a client, and we offer them and their mistresses two of the company seats on a flight to space,” Tweeted Mark Cuban, owner of the NBA Champion Dallas Mavericks. Single tickets for a ride on a commercial spaceflight are estimated to cost anywhere from $250,000 to $1 million each. Exxon Mobil and Wal-Mart executives have already bought up the first dozen commercial spaceflight tickets. Several members of the New York Yankees are planning on doing the same soon as well. Former Facebook executive Eduardo Savern announced he will buy 20 commercial spaceflight tickets, and vowed not to pay any taxes on them. Presidential candidate Mitt Romney has also announced that not only will he attempt to become the first Venture Capitalist in Space, but if elected President, he will issue an executive order to forbid gays from riding on a commercial spaceflight---just to be a douchebag. It is believed that this plan is aimed solely at former N*Sync singer Lance Bass, who is openly gay and attempted to buy his way into the Russian space program ten years ago. Romney also said that he plans to downsize Richard Branson’s Virgin Galactic commercial spaceflight company into oblivion--- regardless of whether he wins the Presidential election. 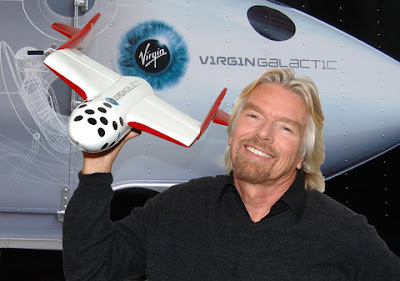 “I will definitely be the first Venture Capitalist in space. But, I will not allow a Frenchman like Sir Richard Branson to run a company that shuttles free-thinking hippie space tourists into orbit,” announced Romney.